BEDA was designed as a computer-assisted tool developed with web-based technology for the assessment of cognitive processes involved in university students with dyslexia (i.e., phonological awareness, orthographic processing, naming speed, lexical access, verbal working memory and semantic processing). The standardization of BEDA has been conducted with undergraduate degree, master and PhD students from three Spanish universities (University of La Laguna, University of Girona, and University of Las Palmas de Gran Canaria). 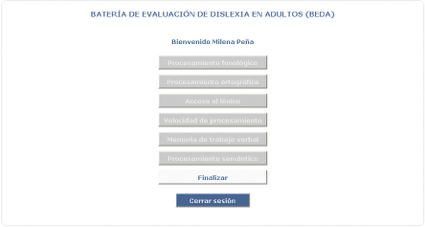 Finally, BEDA is part of an e-learning platform (Platform for Assistance and Intervention Dyslexia in Adults: PIADA), along with other identification and assistance tools, with the aim that can be used by teachers and university students, and thus help to meet the challenge to provide university students a resource that enables the identification of dyslexia and provide information to teachers on strategies and guidelines with students with reading disabilities. (1) PF 1 Task: to separate words into syllables. (2) PF 2 Task: to count the number of syllables that have the words. (3) PF 3 Task: to divide words into phonemes. (4) PF 4 Task: say words that rhyme. (5) PF 5 Task: two pairs of words are compared and must say if both rhyme or not. (6) PF 6 Task: two pairs of words that have a different sound and you have to decide if that sound is different compared to the beginning, middle or end. (7) PF 7 Task: should skip pseudo segments. (2) Pseudo-homophones Task: choose the word correctly written two presented on the screen. (1) Naming Task: to read words accurately and quickly. (2) Pseudoword Task: to read pseudowords accurately and quickly. The success / error and latency time is recorded. Words and pseudowords are presented in two separate blocks. The block of words is formed by 32, and pseudoword stimuli are 48. D) Processing speed: This task is required to be selected as soon as possible the same stimuli from a series of distracting stimuli. The execution time of each task and the number of errors is recorded. E) Verbal Working Memory: This task consists of presentation of a pseudoword for one second, then the user has to write a piece of that pseudoword. F) Semantic Processing: consists of two tasks that reading comprehension is evaluated. After the reading of the texts has to answer a total of ten questions for each text.